I realised while I was amongst the live sound of Ben Marston’s Quartet going live to air on ArtSound that I was privileged to be there. To hear the banter and reasonably controlled confusion that exists around the professionalism and impressiveness of the music itself. This is music speaking for itself. The band didn’t even know what they were to play for the last tune, but who’d know (other than because they said so to the listening audience, of course). These guys know each other after years of a weekly residency and although it finished 4 years ago, it’s still there in their interactions and their bumptious joy in performing their electric versions of some very well known standards. Although well known, some purists might not recognise Miles in this concoction. But I reckon Miles would enjoy the musical humour and coquettishness of it all. Needless to say, I enjoyed Ben’s band immensely. 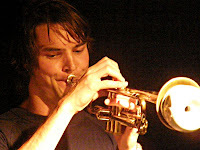 Ben played a clean sounding trumpet or flugelhorn, but it sat neatly with clear solo lines and occasional flourishes. 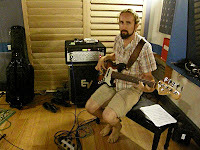 James toys with us, with the deepest of sub-bass sounds and Pastorian chords and a delightfully unsustained, string slapping sound on his home-defretted 5-string Fender jazz. Lachlan riffs richly with those fast lines that guitarists do, reminiscing on the US West Coast sounds of recent years, with just an edge of distortion. Chris was blissful in his so apt but so modular yet fluid patterns, and his zen-like appreciation of the ringing of cymbals. I remember a one-note passage in a solo by James on All the things you are that just moved the dots around the bars. Just lovely, and so playful. Then a heart-beating rhythm on the lowest of bass tones (down deep to 20Hz and thereabouts) and a steady, then simple but pure drum solo. The tunes are ones we all know (although not Material girl this night; their locally famed adaption of Madonna’s magnus opus): Blue monk; a 25 minute medley of Third rock from the sun, All the things you are, Nica’s dream and Nardis; Solar. Ben’s original, Accidental instigation, is obviously not so well known, but it sat perfectly comfortably in this lofty company. 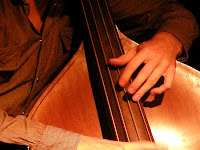 Comtemporary jazz is all things to whoever wishes to listen. I’ve just heard a CD from a tuba / clarinet / banjo / drums outfit from Sydney, and it’s witty and humorous and I enjoyed it immensely (The fantastic terrific Munkle). This is more electric, Pastorian, so hitting on the fusion scene, but with similar, ironic, pomo credentials. 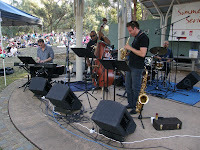 See this band, as Trident or Quadrant or Ben Marston’s Quartet or however they name themselves on the day. 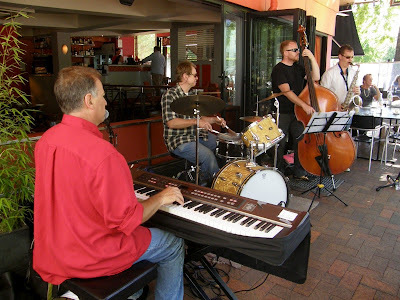 They are a local jazz institution and not to be missed. It’ll be a privilege for you, too. 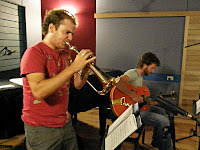 Ben Marston (trumpet) played with Lachlan Coventry (guitar), James Luke (bass) and Chris Thwaite (drums). 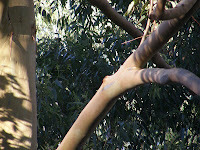 Canberrans obviously don’t have a problem with a challenging harmony, because there were lots of both of them present when Vertical played for that quintessentially middle-class event, the Summer Series in the Australian National Botanic Gardens. It’s a gorgeous environment, in a dry Australian way, and the weather was perfect and sunny after several days of evening thunderstorms. 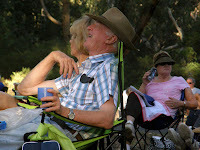 The families with young kids and grandparents were out, everyone sitting back with picnics, variously chatting or listening or dancing or joking. The good Aussie cheeses and wines and a few beers made the show, but in a dignified and restrained way. Truly, an apt image of a comfortable modern Australia for an Australia Day weekend (which it was). We can agree to forget wars and financial catastrophes and indigenous disadvantage for the duration, and enjoy the pleasure which modern Australian life is for most of the population. I’ve written up Vertical before. Eric Ajaye leads with his signature lithe, growling and fluent double bass, and sometimes switches to electric for funkier tunes. All the while defining rhythm with authority and harmony with transparency. 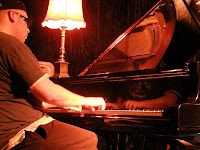 Paul Dal Broi is an image of concentration and intent, in presence and in playing and there are some gloriously mobile dissonances amongst them, but only when it’s due. I think it was Hancock I heard in the funky tune, but he often spoke with recognisable jazz voices. Chris Thwaite is always carefully expressed, leaning towards understatement, but released some extravagant solos against riffs on the funkier tunes. Niels Rosendahl was sitting in. 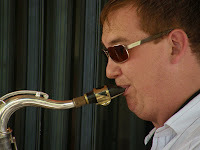 His playing expresses an experience and intimacy that his years belie. His is a metallic, clean, controlled sound. His is always the true melodic statement that so perfectly befits a piece, perhaps simple blues or balladic melody. But then the release into patterns that repeat through beguiling dissonance to a faithful resolution, or sheets of shimmering but moving harmonic clarity. You can hear his commitment and practice: the basics - scales, arpeggios, extensions, through all the keys - are just plain right, all the time. But it’s not just limited to that. Rather it’s held under musical control. As it should be. The tunes were mostly ones I’ve heard from this band before. 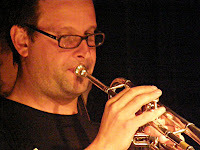 Paul arranges a number of interesting popular tunes, and they are transformed into jazz expressions of complexity and sensitivity. They fit like a glove: One hand one heart, True colours, even Raindrops keep falling on my head. 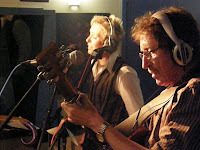 Lean was a new one for me, a medium paced funky number which ended with a heartbeat groove. 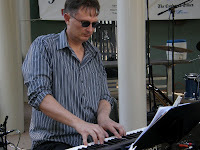 Paul composed another that I recall, a lovely tune called Three for Rose, dedicated to his deceased grandmother. It was a gently swinging number, with an ascending call and a descending response. So, a fine performance, and a fine view of modern, cultured, easy-going Australian life. 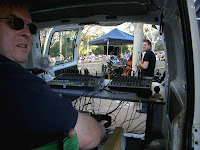 And ArtSound were broadcasting live to air, so just one more confirmation, if needed, of the nature of the Canberra lifestyle. I’ve included a few pics to expand on my word picture. Fine performance; fine and relaxed little society. If Leo Joseph is a first cousin, then DeeJay Gosper is first cousin once removed. Or thereabouts. 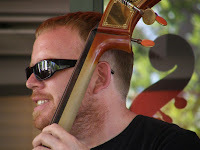 They are both blues influenced, and both use jazz-trained players in their bands. But DJ’s a little more white rootsy or folky in her style. Less dirty down south blues and sometimes verging on lighter influences. It’s serious in its own way, but further from the heart of the jazz tradition. Nonetheless, DeeJay’s live broadcast on ArtSound was a competent and satisfying affair. 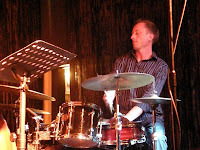 Leo (dirty blues cousin) was sitting in for the first half, and the rhythm section comprised Raf Jurjen and Aidan Lowe (close relatives, jazz branch). 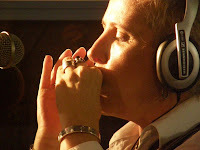 But the feel was determined by DJ with her voice and occasional blues harp and offsider guitarist/vocal harmonist Englishman, Christo Carlsen. 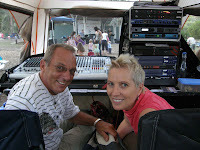 The band goes by the name of KarismaKatz. The website just gives bios of DJ and Christo, so obviously this is the defining core of the band. And it’s a busy band that presented a capable, honest, bluesy performance. There was some jazz, if at the smooth end of the spectrum. There was a gentle, comfortable swing on Comes love (tamer than Shirley Bassey’s big band version which DJ said had inspired her). I like that song, and also Leonard Cohen’s Dance me to the end of love. (It’s a great song, but I’m tiring of Leonard Cohen in every paper you open. SMH yesterday reviewed two LC novels, recently reissued. I read one a good 30 years ago, and it wasn’t new then. Now they are clearly an expression of another era.) I didn’t recognise too many tunes from the repertoire, but I only have eyes for you and I don’t mean a thing are known to CJ. Otherwise, these are tunes from another songbook. Still American, still black, but with some influence from white roots traditions, with sweet paired harmony voices and open emotional expressions. But the evening ended with Sensitive kind, a heavier blues with the opportunity to let go. A move towards black roots to end the night. KarismaKatz are obviously nowhere near the avant-guard end of the jazz spectrum, but DJ presents a competent band, has a long history in the blues scene, and the frequency of gigs shows her popularity and commitment. Nice one, DeeJay. Thanks and enjoyed. 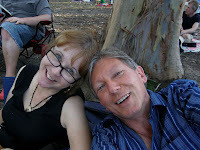 It was a hot, relaxed day, so it was a perfect opportunity to visit the family, and they were playing down at Manuka. The close family is the jazzers, but the first cousins are the blues players. 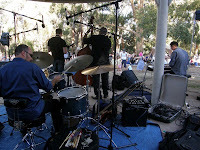 Leo Joseph’s Key Grip is a blues outfit, and today Leo was playing with several jazzers in his ‘lite’ quartet. So there was that intriguing mesh of the intellectual and complex nature of jazz with the simpler but true and involving sounds of the blues. Leo started with a solo stride instrumental and continued with various twelves bar tunes in different keys (but common favourite Bb) and different meters. 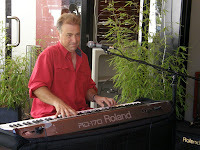 He accompanied a few with vocals, interspersing all with amusing and very natural banter. “We’ve settled on a song. We’ve had a committee meeting. I was overruled … again. 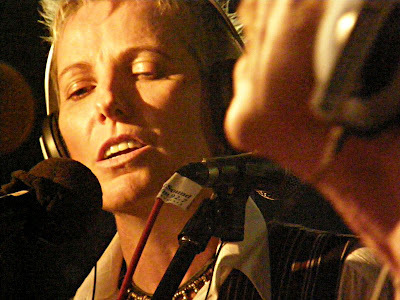 This is an arty song …” Amusing and engaging, and presented with good humour. The rhythm section was tight as. Phil and Mitch locked in, with Mitch providing a wonderfully steady, pure and simple brush pattern (I think he played brushes for the whole set) and Phill playing fairly simple blues lines with evenness and clear statement of the underlying harmony. 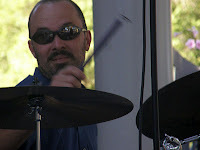 With such a rhythm section, the soloists could play with abandon. Leo made simple but apt blues statements from the heart of the tradition. So did James most of the time, but then occasionally he’d let go with a speedy line, or some dissonance that lifted the level of abstraction. I’m currently reading Alyn Shipton’s “New history of jazz”, and he writes of just such combinations in the early days of black music, with the “syncopated orchestras” and the great female blues singers in the time of Bessie Smith. Route 66 is uber-common, but their sleazy, slow, down-home version was lovely. 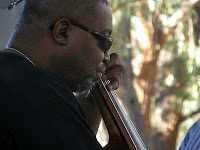 There was Percy Mayfield, and a string of other 12-bar numbers with various feels and occasional lyrics. There was even that “arty song” mentioned above, which seemed to still be based on I and IV but with some cycle of fifths turnarounds. Not too complex, but not fundamental blues, which appears to be Leo’s love, and which he does so well. 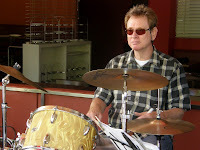 Leo’s a strong leader (I’ve played with him and I know his sense of clarity and correctness), and his band’s a capable mix of the jazz exotic and the initiated blues-men. I enjoyed the visit to the family. 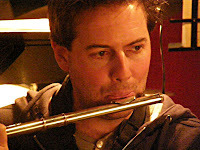 BTW, Leo also plays in a larger format with a full horn section, thus the ‘lite’ moniker for this incarnation. 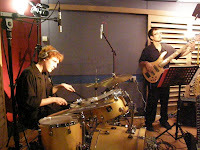 Key Grip lite was led by Leo Joseph (piano,vocals) with Mitch Preston (drums), Phill Jenkins (bass) and James LeFevre (tenor sax). 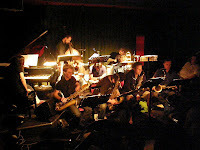 Bennetts Lane Big Band was very cool, as was the venue. 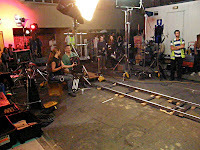 The film being made outside the door just added that additional bit of swizzle. Jazz clubs are great for that dark, searching, existential atmosphere that suits movie realism, so it shouldn’t be too surprising. The amusing thing was that it was all shuffle and busy-ness and light for the movie’s creation, and this was so different from the personal themes being filmed. Film making is like that. 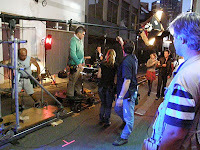 But musos stood amongst film crews while having a smoko, listeners lined up to pass through the blocked door after the performance, and generally the music had proceeded totally oblivious to the video-based arts happening just outside the door. It was strange in that way. 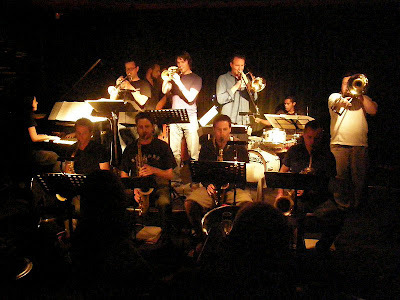 The BL Big Band was formed in 2001, and plays monthly at the club, along with other occasional performances. Big bands are not easy to gather, so you takes your chances when you can catch one. I was glad I got there for this evening. The band had three irregular players sitting in, and I’m not too clear who they were. Everyone seemed to be concentrating on charts, or otherwise sitting with distant faces while waiting for their parts to arrive. Nothing unusual here. They played two sets totaling 9 or 10 tunes: all originals other than Ian Whitehurst’s arrangement of Ellington’s Half the fun. Half the fun was a unique setting, with a steady rhythmic pulse underlying the whole. The other tunes were more complex, more varying, more symphonic. There were passages of simplicity, others of rabid bop lines, others of subtle and smooth harmonies, and those glorious individual efforts as solos and other features. 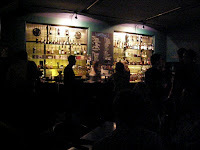 There were ballads and lively rhythmic pieces and lengthier suites. There was leader Eugene Ball with introductory comments, and some witticisms. 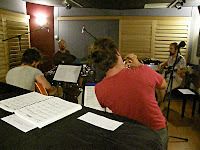 According to Eugene, one tune was like “James Brown on acid”, and another was “written for some visiting Danish deros”. 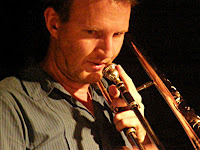 I was amused by abstruse changes in a tune by Tim Wilson which moved between swing and sharp staccato horns through boppy lines to piano solo and ultimate cacophony and ended in baritone sax and bass trombone passing solo passages between themselves. It seemed a challenge for the band too, with starts and stops and counts and calls helping the players through the charts. 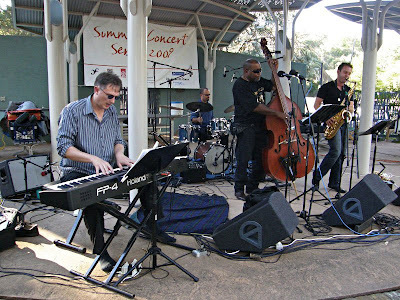 I recognized several of the tunes from the band’s CD, The snip, but I found the performance was far more satisfying than the recording, perhaps given that the actual recording was from the first year of the band, although only released fairly recently. Tunes like Andrea Keller’s Portrait of a simpleton and Jordan Murray’s long and baffling Requiem for a parking inspector obviously tell stories although I was a bit befuddled by such a long piece for a parking inspector. But then I overheard the band talking of parking before the gig, so maybe it’s a big issue around Bennetts Lane and worthy of such an epic. Some impressions to follow. 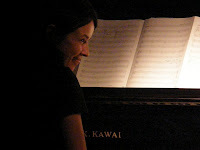 Andrea Keller’s piano fills and solo passages were of great harmonic complexity and unexpected dissonance layering washes of emotions. Tim Wilson floored me with a really superb feature solo on alto: lengthy, totally unaccompanied, sounds of breath and flapping pads. The bass instruments featured occasionally: Sam Anning (who was sitting in) provided another stunningly effective solo; Adrian Sherriff on bass trombone was fabulously lithe in several solos; the bass horns, Adrian Sherriff and Phil Noye on baritone sax, swapping lines for that big bottom-end feature I mentioned above. Visitor Paul Williamson played another wonderful solo that was smooth sounding and inevitable, but with some challengingly jerky and edgy lines thrown in. 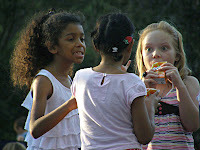 But a large ensemble is not about individuality, rather community. Despite some players sitting in for the night, this was a mature and together performance, with sharp rhythms, clear-ringing harmonies, and mellifluous horns parts, to go with their modern, raging and sometimes confronting charts. 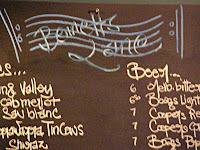 This was my first visit to the legendary Bennetts Lane. I obviously chose a great night to attend. I’d heard the CD several times, but I was not prepared for the stunning live performance and the good natured, relaxed presentation in this small and intimate space. Very, very nice and very memorable. 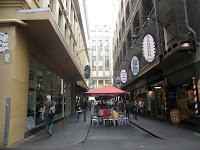 See the film (Centre Place) by all means, but go out of your way to hear this big band. Just wonderful. 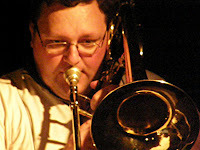 On the night, the Bennetts Lane Big Band comprised Tim Wilson (alto sax), Julien Wilson and Ian Whitehurst (tenor saxes), Phillip Noy (baritone sax), Paul Williamson and Eugene Ball (trumpets), Jordan Murray (trombone), Adrian Sherriff (bass trombone), Andrea Keller (piano), Sam Anning (bass) and Rajiv Jayaweera (drums). 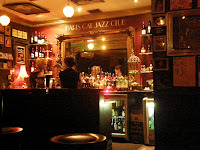 The Paris Cat is a jazz bar in what I understand to be true Parisian style (not that I remember such luxuriant surroundings at the few clubs I attended in Paris way back). 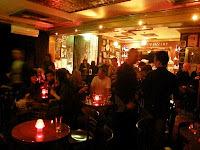 It’s small and dark and in a basement; it’s supplied with a well stocked bar with barmaids in Parisian best-black; it has round tables with candles; it has jazz portraits aplenty, even on the ceiling. Nice one. 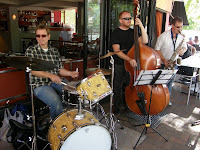 The program shows it’s closed Sundays to Tuesdays, but otherwise seems to present a busy series of modern jazz bands. I noticed that the program handouts have Bennett’s Lane on the back. I’m told they have different management but work together closely. We can be greater than the sum of our parts. 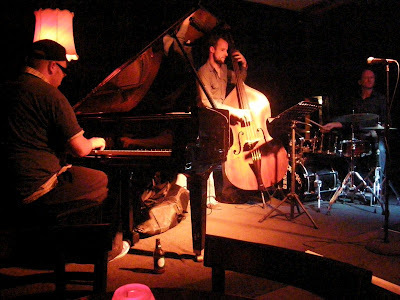 This night, the Melbourne Jazz Coop was meeting for Aaron Choulai playing with Sam Anning and Rory Mcdougal. I was glad I caught Aaron, as it was my last opportunity before he was to leave for Tokyo for several years in the following week. 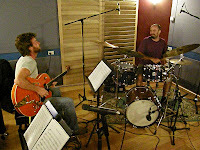 From the first bass and drums notes setting a miasmic rhythm pattern, I was in bliss. This was the highest quality of modern playing. It was mostly original tunes. There was one standard (I’ll be seeing you) that only showed its head with the melody after long interludes of piano and bass improvs. 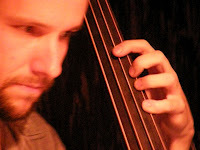 There was also a Neil Young tune, which reminded me of Bad Plus in its interpretation. This was all dramatic: growing and mutating naturally through a rich assortment of harmonies; fluid in metre and malleable in harmony. Aaron playing contrapuntally or drifting through harmonies with sheets of rolling arpeggios or deliciously timed sparseness. So, tasteful, but far more: profound and witty, and always appropriate. 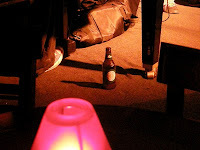 (He had a nice taste in beer, too: Coopers green, Pale ale I think). 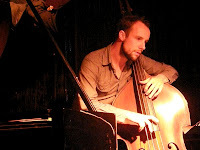 Sam Anning is one of my favourite bassists these days. I’ve heard him at Wang and at Hippo, and he’s always wonderful. This night he was stunning. A beautiful tone, reminiscent of gut (Velvet strings, Realistic pickup, Gallien-Krueger amp; not sure about his bass although this may be the most significant component). But most importantly, his playing: stunning! Modern, fluid, responsive, contrapuntal, implicit; lots of solos, stunning speed but only when needed. It was a beautiful and memorable performance. I hadn’t seen Rory Mcdougal before, but I heard him as perhaps reserved, providing a busy but gentle wash of colour, some lengthy solos and just a very few hard snaps for accents. The trio as a whole was a wonderfully engrossing: truly stunning and satisfying modern piano trio playing. A few other impressions. 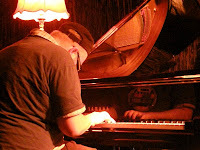 The final tune was a C-blues played with exemplary perfection and with constant, obscure, intriguing turnarounds. I loved it. And the penultimate tune, which was an original ballad by Aaron dedicated to now-deceased Melbourne bassist, Gary Costello. I remember seeing Gary with Vince Jones. I think this was when he talked of just wanting to be the best bass player in the world (I thought this was a big call at the time). 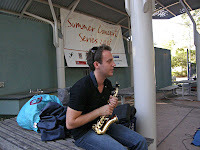 And again playing a challenging duo set at the Melbourne International Women’s Jazz Festival a few years back. I’ve heard several players speak admiringly of him, so he was obviously much loved. Vale, GC. 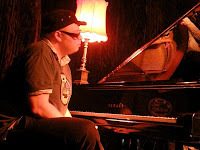 Aaron Choulai (piano) played a trio set with Sam Anning (bass) and Rory Mcdougal (drums) at the Paris Cat Jazz Club in Melbourne.